So you’ve been successful at making poached eggs, right? Well, hell, why not try your hand at some buttery biscuits to slide right underneath that egg? First, I should preface this entire entry by stating right off the bat that my biscuit-making chops are only a couple months old. In fact, I don’t think Canadians really eat biscuits…to me, it’s an American thing like chicken fried steak and well, biscuits and gravy. 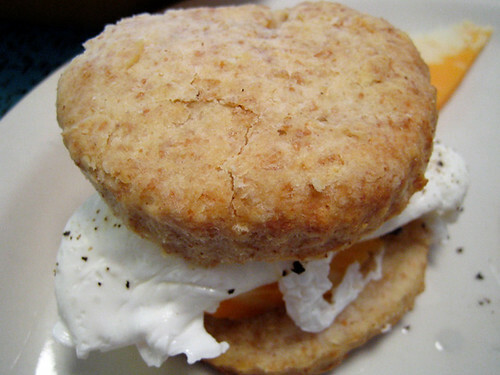 A biscuit is like a Southern cousin of the scone and is meant to be flaky and light and not just eaten for breakfast – my recently transplanted to North Carolina friend just told me about a place by her house that is a biscuit-only restaurant (with drive-thru, of course). When I’ve taken trips below the 49th parallel, I’ve definitely had my share of biscuit n’ gravy eating and the best ones I’ve ever had were at the Dish in Seattle. It was high time to recreate that buttery, light perfection! When I stumbled across a biscuit recipe from The Non-Dairy Queen it looked relatively fool-proof to a newbie like me, so I decided to give it a go. Rumor has it that Canadian flour has extra gluten (read: heavy) compared to the stuff found down South, so I’m sure these aren’t authentic in the least, and these aren’t as feather-light as the ones I’ve had in American diners. But it’s a simple recipe and it’s pretty damn good one at that…especially since I’ve played with the recipe a few times adding and substituting like I love to do. I’ve made this recipe with only all purpose flour and most recently a mix of white and whole wheat. Didn’t matter, these biscuits still turned out delicious. I also have made this with just skim milk but then this morning ran out of most of my milk so I subbed in some plain yogurt to make up the difference and once again, the recipe wasn’t worse for wear. So go ahead, try your hand at biscuit making. If you do decide to use Earth Balance, I’d suggest reducing the salt or getting rid of it entirely. These are great smeared with blackberry jam or torn into two halves to make a great poached egg breakfast sandwich. Or give your healthy resolutions a break and stir up some gravy to go alongside. It will be our little secret. 1. Preheat oven to 450 degrees. In a large bowl, combine flours, baking powder and salt. Cut in butter until you get something resembling coarse meal. 2. In a mixing cup, combine the yogurt and milk and stir until blended. Add to the flour mixture and gently stir to combine the mix into one lump of dough. Don’t over blend. 3. Dump onto floured counter top or an unfloured Silpat mat and flatten into a 3/4″ thick circle. Cut out circles with biscuit butter and place on a cookie sheet. The Non Dairy Queen says to keep them touching for soft sides, but I like them crispy on the outside so every biscuit has a wide berth. Bake for 8-10 minutes or until they are slightly golden on the outside. I haven’t made biscuits in ages… I used to be the queen of baking powder biscuits. Thanks for the trip down memory lane, with your recipe I will have to try them again. Sadly, I am a southern girl without any biscuit making ability. I tried once and they tasted like raw flour. Bleh. Damn, you are making me very hungry. I’m here at the office thinking of food when I should really be working…LOL! I’ve never, ever had biscuits before as I have never traveled to the Southern U.S. But I think it’s high time I gave biscuits a whirl. I’ve been doing a lot of my baking with soy flour lately as a way to up the protein and decrease the carb count but I think I need a break from that regime, so perhaps this upcoming weekend I will try my hand at biscuits and poached eggs. Yum! I grew up eating biscuits at least twice a week, but somehow ended up without a decent recipe. I can’t wait to try this one. Do you think that it would work well with all WW flour? Maybe WW pastry flour? Your biscuits look beautiful! I am so happy to hear they turned out well for you! I love playing with recipes…in fact it is an addiction I have. I never follow a recipe 100%. I have to put my stink on it! Thanks for this classic biscuit recipe. During these cold winter months I am all about the comforts of baking in the morning. Actually I did grow up with biscuits here in Canada. But we usually ate them one of two ways: with stew (sometimes cooked on top of the stew as dumplings) and for breakfast with jam (like you would with scones). I’m guessing it is a British thing – as many southern foods are in fact British in origin. 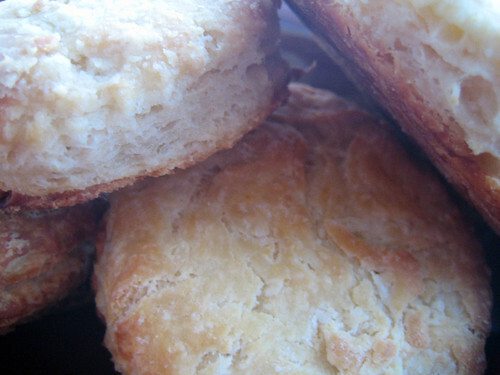 I have been obsessed with Southern food lately, and as such, have been considering making biscuits. I picked up the Southern Food issue of Gourmet, which had a few recipes. I think I will be copying you and making biscuits and eggs soon! hag, you’ll have to post a recipe for your baking powder biscuits! rachael, i’ve heard all about the wonders of white lily flour! sadly, i’ve never seen any north of the border! bijoux, i’ve never been to the southern states either (south-western doesn’t count! ), but these are pretty tasty! beth, i like the idea of cooking biscuits on top of stew, like dumplings. in fact that might be tonight’s dinner! i couldn’t agree more, veggiegirl! aimee, yes indeed! morning baking just seems to make everything cozier. give it a try, judy. they are wonderful! lydia, a southern food issue of gourmet? i think i’ll have to pick it up! biscuits and gravy = the best wintertime breakfast. ever. with maple sausage. drool. 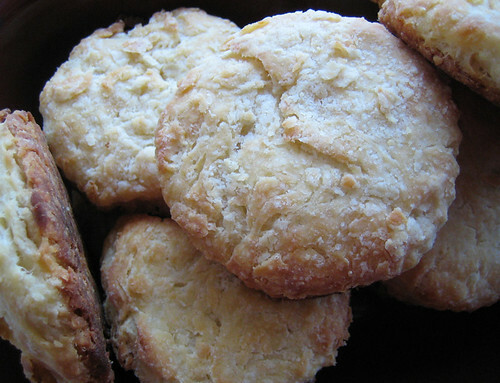 i don’t have a biscuit recipe that i really like and that is reliable, so thanks for this one! just last night i was at a friends and had homemade chicken soup with dumplings cooked right in the soup, and even though the biscuits were made with bisquick (which i don’t think i could bring myself to do) it was darn tasty and reinvigorated my love of all things biscuitty. Yum! I’ve been craving biscuits just like this. These look great. Biscuits were a big thing in my Canadian household. The most common way for us to eat my mother’s sweet biscuits was as the base for strawberry shortcake–split open in the center with crushed berries spooned over, then the top part of the biscuit added, more berries spooned over top and then a sizeable dollop of real whipped cream. I still use my mother’s recipe for biscuits to make shortcake–usually blackberry or raspberry…but strawberry really is the best. I also make some wonderful pumpkin drop biscuits which are great with winter’s bevy of soup recipes. I think the gravy part is more attributed to the U.S.,no? Ok, I’ll cop to using bisquik on occasion. I actually think the boxed biscuits come out a little more flaky and light than using our high gluten Canadian flour- even if they do have the feintest tinge of “out of a box” flavour. I usually play around with them though to make myself feel less like a cheat – I add cheddar and spices to make them savory, or crasins and sugar to make them into fake-out scones. If I’m already making a huge meal, and the biscuits are just an accompaniment to it, I’m ok with a little cheating here and there. thursdaynightsmackdown, i’ve had good luck with this recipe! maple sausage? yum!! thanks, eat me, these are delicious! anon, i’ve made strawberry shortcakes with biscuits before…so amazing! i can’t wait for strawberry season, now! beth, i say, cheating is totally acceptable! I am always looking for a good biscuit recipe! Never heard of one with yogurt. Can’t wait to try it! i made a chicken pot pie filling and used this biscuit recipe heaped on top of it. it was very good. i like this blog because the ingredients are what everyone usually has in their kitchens and the recipes are very straightforward, simple and tasty. I just made these, and have thrown out / deleted every other biscuit recipe I have. They turned out flaky and light, with beautiful layers! caroline, hope you like this one. yogurt is my own spin since i never buy buttermilk! thanks priya, glad to know that this recipe holds up as dumplings too! yay vicki, glad to hear!! Preheat oven to 495 degrees F.